How can advanced software optimize the performance and utilization of flash storage? Transcript of video interview w. Kaminario. How Do I Optimize Flash Storage with Software? Transcript: I'm Mike Matchett from Big Data and we're gonna talk about how the world is changing, and not just any world but our IT world. Things are changing in flash storage, they're changing in servers, they're changing in how we approach the Cloud. I'm gonna have on here Kaminario, Josh Epstein who's the CMO, is gonna help explain what's happening with them in the sea of changes, some cool things. But first I just wanna talk about all flash storage. Historically all flash storage has been at first the thing you bought to really amp up your high priority critical application. You spend lots of money, gets these physical boxes that were just optimized within a hair's breath of their life, rack them and within six months you're probably replacing them because there was something else just a little bit faster, and you could afford it for that top application. Over the couple years obviously the price of flash has dropped, everyone's adopting flash. We're seeing all flash data centers even come about, and yet it's still a competitive world. We still want that top edge performance. And now there's things like NVMe coming out, there's multiple tiers of flash, and at the same time we're pushing some stuff up into the Cloud in a hybrid Cloud world. So while some people thought the storage world was kinda dying, the why I'm looking at it it's actually getting more exciting. With that note let me introduce Josh, welcome Josh to the show. - Thanks Mike, great to be here. Who is Kaminario in the World of Flash? - So just a little thumbnail, Kaminario is definitely the high performance flash array vendor, right? We've seen that for years, you guys ultra engineered high flash but now you're telling me the world's changing and you're not a hardware vendor anymore, you're not shipping hardware, what is this? - Yeah I mean so Kaminario has been on the scene for several years, right? We really did cut our teeth as the deep performance leader. I'd say over time we've really shifted that to the price performance leader, we definitely recognize that modern applications need high performance storage infrastructure to deliver these kinda new customer experiences that everyone's expecting. But they really needed to consume it in a different way. So we really have that switch the way we go to markets, switch the way we sell our product and really shift to even the type of buyers that we're looking to partner with. - So couple of things we just wanna cover real quickly, we were talking. What is the Cloud Fabric Effect on Flash? One is you are now able to deliver this value as a Cloud fabric, tell me in your words, but it's a software thing not just intimately tied with getting a rack of stuff off a truck and plugging it in, it has a common array bezel on it. Tell us about that. - That's right, and we really made a significant shift in our business model over the last six months that allow us to do this. First thing we did is sign a interesting agreement, really in alliance with Tech Data. Tech Data's a 36 billion dollar global distributor, everyone knows Tech Data. What they do today for us is they actually manage all of our hardware, so we still sell an appliance. You can still buy a common array with a bezel. - Gotta get the cool lights and bezels in there. - Exactly, and when you buy that the way it works is Tech Data actually just delivers it. So Tech Data does all the integration, both the hardware and the software, it shows up with a bezel ready to go. Now it's good from Kaminario because we only take the software piece of that. So from a business model standpoint, from a profitability that's a much better way to do business. The second thing we did, leveraging that relationship, is open up a new consumption model for Cloud scale service provider, whether it's a large SAS provider or a large e-commerce provider, or true Cloud infrastructures as a service provider. What they can do is actually just purchase that hardware, that basic hardware from Tech Data and then acquire a usage based software model directly from Kaminario, where they only pay for what they use. So this creates a much more flexible, much more agile, much more cost effective way for a large environment to actually build out an infrastructure. And it really does look a lot more like the true software to find nirvana that everyone has been looking for, but you're getting the tried and true trusted environment from a world class array that's been proven in the market for several years. - And we know and it'd be a whole nother topic to talk about, that you can scale up, you can scale out, you can do some very cool things with the way your architecting things skip to petabytes in the same fleet, but I think at the same time you've unlocked this from a business model perspective. You've also added this thing called composability, so tell us just today about what composable does and I think it ties into that same MSB kinda perspective, right? - Yeah definitely, so from the beginning Kaminario has had this extremely flexible scalability model. The ability to both scale out and scale up, right? So it really was, always been a good match for the large application, SAS application provider that wants to really dial in the amount of performance and capacity that they have in their infrastructure. What we've done is also announced our next generation platform that leverages NVMe technology, they'll fully converge NVMe back in, to really open up a whole new level of agility. Now everyone thinks of NVMe as a path towards extreme performance, that does deliver that, we definitely get a great performance boost by replacing both the drive technology as well as the back in networking with this really low latency protocol. But there's something actually really unique in that Kaminario can take advantage of in the software layer as well, the ability to really have this data center full of this NVMe over fabric connected resources. Then that you're able to actually manage at the software layer, creating these virtual private arrays really, the ability to associate a couple controllers on one side of the data center to a J bok on the other side of the data center. Compose them together and call that an array, and then in real time the ability to shift resources around at the software layer, with no physical reconfiguration. So it really does create this extremely agile way to manage a software defined data center, and it really does fit very well with this Cloud fabric model of actually acquiring and paying for the software based on actual usage. - I really have to wrap my head around the idea of how we've evolved from this stack of all flash, dense boxes that were tied to a single application to now, pieces that could be modular, could be deployed across a data center you said. High through put fabric, low latency fabric, NVMe over fabric, stitching that together and then creating virtual private arrays and delivering them back out to applications. It really gives you a way to journey towards an all flash data center without having to do a complete lift and shift I think, it sounds like a way to really adopt it and get it in there and migrate it, and also keep it evolving. - Yeah and I think that a couple things have come together. You know one obviously, the hardware technology. I mean the NVMe protocol has really just been released over the last 12 months, and so that is ready for prime time. The other piece I wanna add is that we're able to leverage our existing software stack, so vision OS is our operating platform, it's the operating platform that manages our appliance. That exact same operating platform is able to manage these NVMe connected resources. So you're getting the full benefit of a enterprise hardened set of data services, from a replication standpoint to a compression Dedupe standpoint, and obviously some availability and redundancy standpoints. It's not like you're just starting from scratch, as we all know there's lot of startups out there that come on the scene that have, say skating a hot performance leveraging NVMe, but the ability to actually leverage out hardened data center grade, enterprise grade set of data services is extremely important. - And I think with that you've talked about, if I'm getting this right, two thirds of your software stack and it leaves something called clarity left, what is clarity doing for us and how does that add value? Yeah, so clarity really evolved out of our efforts to build a Cloud based support, kind of a call home if you will, functionality. But it's become something much more so clarity does give a customer kind of the portfolio wide visibility of what they have installed, across multiple sites. 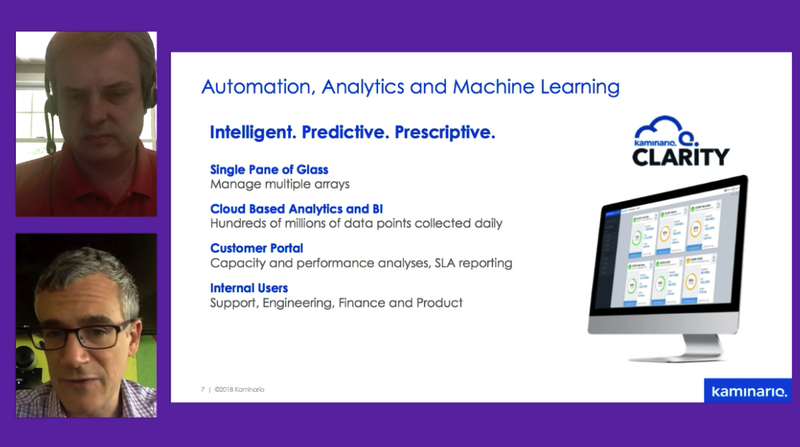 Allows a single plane of glass management, it also provides a rich set of prescriptive analytics. We gather lots of data off of a given infrastructure and we can actually compare it to a broader set of data. We have some sophisticated machine learning algorithms that are crawling through all of the data that's in the Cloud, looking for patterns and really helping to identify opportunities for a given customer to optimize their infrastructure. Whether that be through reconfiguration, whether that be from adding some additional performance with additional controller pair, or likewise predicting capacity needs in the near future. So clarity really is our backbone for the division of an autonomous data center, and the ability to really in real time understand and react in infrastructure changes to support an application. - Right, and when you do all this cool storage stuff you wanna make it easier, you don't wanna make it harder, when you get to Cloud and things get more complex and you've got pieces all over data center and multiple tenants, you've gotta bring that intelligence to bear and tie it all together there. So I think that's great. Any place special people should go to find out more information, I assume your website's got a lot of stuff. - Kaminario.com is a great place to start. We are really looking to partner with providers of these Cloud scale data base driven applications that are redefining the way people do business. And we just really want from a storage infrastructure perspective, that those applications are supported and really positioned to grow and evolve with the way that everything is changing to your point, the world is changing. - Thank you for being here today, Josh. We look forward to hearing more about Kaminario. I really wanna see what that NVMe platform can really rock and roll with later this year, so we're gonna keep an eye on that. Thank you for watching today, and we'll be back with some more interesting stories as soon as we can get 'em rolling, thanks. - Thanks, Mike. - Thanks.